We have a small room in this house. A really small room. Big enough for a single bed, a chest of drawers and a wardrobe but not much else. We’ve used it as Wayne’s wardrobe room since we moved in, with a single bed just in case we overflow with visitors. It was always a mess. Wayne owns too many clothes for one wardrobe, a cupboard, a chest of drawers… and this house. 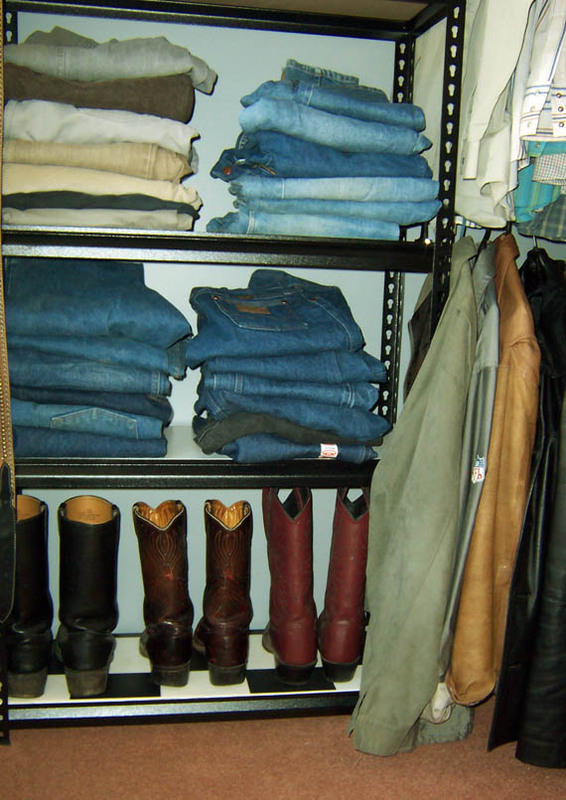 He owns too many boots and shoes for any normal human being except Imelda Marcos. I’ve been sick of that room pretty much forever and I’ve been dying to make it into a walk in wardrobe with as much hanging space as I could fit into it. 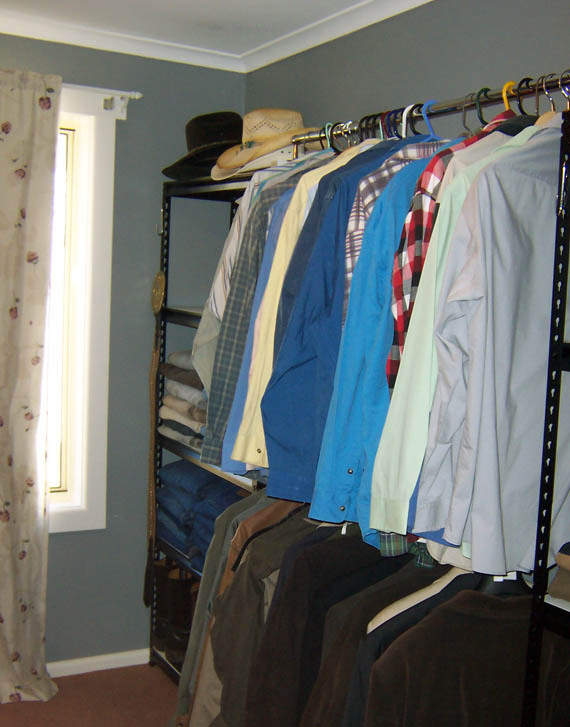 So, I finally put Project Wardrobe Room into action. I decided the easiest way to make a wardrobe was to start with something someone else had built. I like the industrial look of hardware shelving so I was looking for nice galvanised metal shelf units meant for workshops. Unfortunately the better/bigger/taller ones are made with powder coating these days. Darn. I bought 2 hardware shelf units on sale a couple of weeks ago. I also bought 2 thick towel rails with the matching attachments. Working towards Project Wardrobe Room, a few weeks ago I donated the single bed. Then I promptly replaced it with other bits of furniture …which I managed to get out of the room last week. Step 1: I opened the boxes with the shelf units, removed the mdf shelves and painted them antique white USA using the paint I’d bought for the woodwork in Fentonbury. Step 2: Paint the walls. I wanted to paint it grey, but I was going to stick to not spending any more money on this project than I already had. 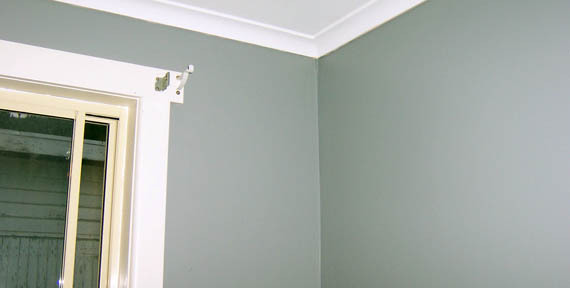 I searched my paint tins and found I still had about 1/3 tin of the dark grey I used on the living room feature wall. I mixed in about 1/4 of the light beige I’d used on my woodwork and added a bit of ceiling white for that extra lightness to get a shade of grey I kinda liked. Then I painted the two walls I could access cause the third wall still had a big heavy wardrobe full of clothes, a large chest of drawers and a cupboard, all chockablock full of clothes, draped with clothes, ties, belts and scattered with shoes and boots. Anyway, it must be the light in this house… or the salmon carpet, but greys tend to look blue-ish in here. The ‘grey’ I picked for the living room looks like light blue. Step 3. Put together the units. 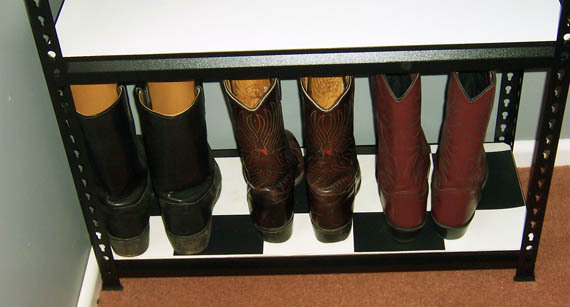 I glanced at the instructions then proceeded to put the units together using one of Wayne’s old cowboy boots as a rubber mallet. I cut a piece of vinyl left over from the mud room for the bottom shelf – easier to clean when dirty boots inevitably leave their mark. I also turned the top shelves upside down so you see the white side, not the unpainted mdf side. Step 4: Find the towel rails and fittings. Search and search and search. Get annoyed, then angry. Have a cup of coffee and then finally locate them in the last place you thought to look. Step 5: Swear at the idiot who used sticky tape to hold the two rails together. Then swear some more at the idiots who stick labels on their products with glue strong enough to glue King Kong to the empire state building. Use eucalyptus oil to get the label and gunk off. Step 6: Figure out where the rails needed to go in order to hold the shirts and jackets, then screw them in place – screwing directly onto the mdf shelving. This bit was like a step aerobics class, involving as it did a lot of up and down the stepladder after dropped screws, dropped rails, dropped end caps. My exercise for the week. Step 8: I moved the chest of drawers closer to the wardrobe and moved an old timber chest I had in the bedroom into the wardrobe room. This will hold Wayne’s swag (aussie sleeping bag for camping). I like the feel in the room. So much more organised. Neat. How long it will stay that way is anyone’s guess. Last touches: I vacuumed. I put in a brighter globe (does anyone else hate those energy saver light globes which take ages to light to their fullest?). I removed the granny light cover that was there and am planning to replace it with something a little more interesting. Still to do: A different curtain for the window. The light fitting. The other wall. 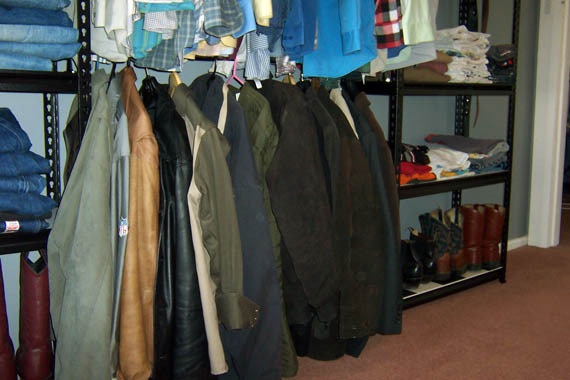 There are suit jackets and pants, more shirts and many shoes that still need to find homes in the new look wardrobe room. Do I keep a chest of drawers to hold underwear and handkerchiefs or do I go with more of the same shelving and rails with baskets to hold the small stuff… there-in lies the question. Now I’m left to clean up the disaster in the living room and put away the 1 tonne of washing I finally folded. But he likes it. It sure beats the kitchen chalkboard fiasco of 2013… which is still fresh in my memory as I’ve only removed half of the chalkboard so far. A low & wider shelf of similar style under that window, with shorter curtains, of course, and you'll have more shoe/boot storage and if you put a cushion on top, a place to sit and pull those same boots on and off. Looking good. And the grey only looks blue in the first photo. In the second, it's a gorgeous grey that I would love in my living room. FYI.